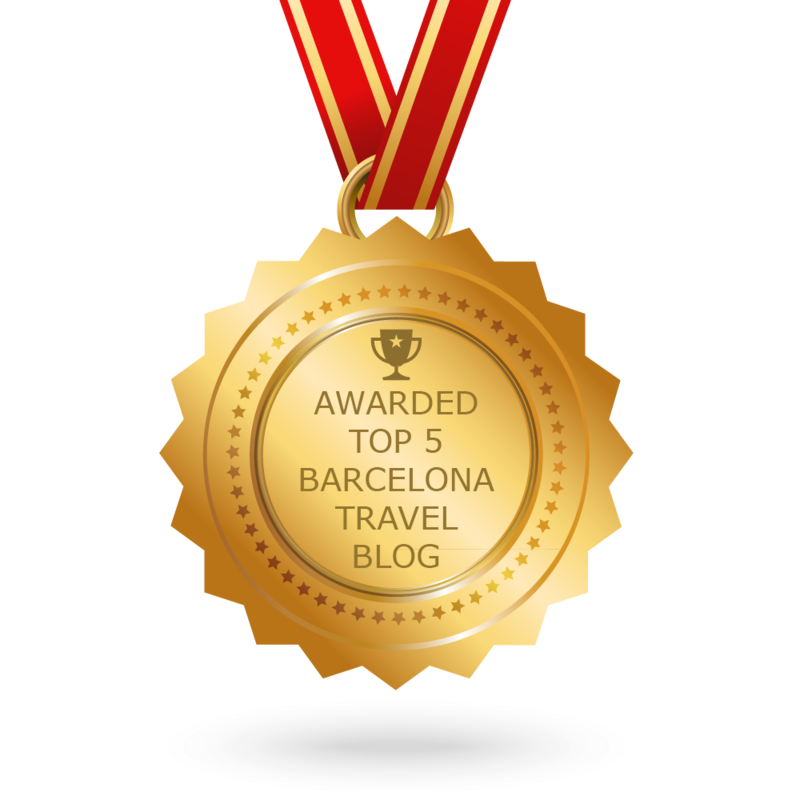 What comes to your mind when you think of Barcelona? The Mediterranean sun, beautiful sandy beaches, tantalisingly tasty tapas, and… street art? 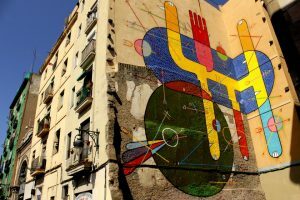 Well, believe it or not, Barcelona is actually one of the biggest hotspots for street art in the whole of Europe, bringing together a myriad of artists working with all different kinds of styles. El Xupet Negre, the black pacifier, is one of the most important artists in the scene and is now one of the 50 most influential street artists of all time. His signature image of a child’s dummy can be found throughout Barcelona, a city he has been decorating with his work since 1991. 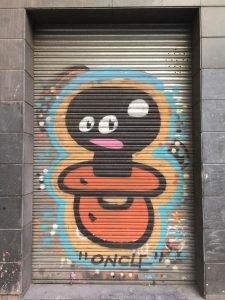 As much as we love the work of El Xupet Negre, we love it even more when he collaborates with other artists in the city, particularly our favourites Konair (whose signature design is a cartoon ice cream) and Pez (who enjoys adding his childlike fish trademark to many of Barcelona’s walls). 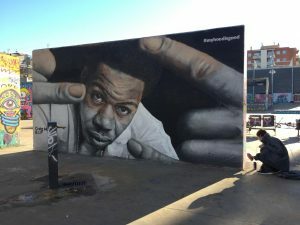 Collaborations by these artists as well as their individual work can be found everywhere in Barcelona and without a doubt help to shape Barcelona’s already sensational cityscape. If the name Keith Haring isn’t familiar, we guarantee that you’ll be familiar with this artist once you see his work around the city. 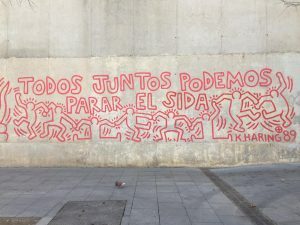 His most famous piece- a mural painted near the Raval Quarter’s MACBA museum- seeks to highlight the importance of AIDS prevention, an illness that Haring himself suffered with during his lifetime. The artist died just a year later after painting this design. The mural was transferred to a new wall on the occasion of the piece’s 25th anniversary in February 2014, in commemoration of Keith Haring. Another piece of street art reminiscent of a great artist lives deep within the city’s El Raval neighbourhood. Curious travellers can find a great mural composed by the artist Sixe Paredes in the style of Joan Miró. The mural was painted during the exhibition From Miró to BCN and to this day, it is one of the city’s most famous paintings. 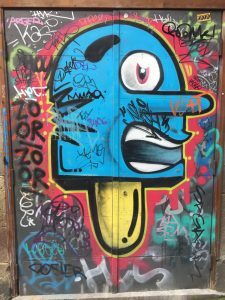 On one of Barcelona’s biggest and busiest roads, Avinguda Paraŀlel in the Poble-Sec district, is a graffiti and skate park which makes all street art enthusiasts get a little hot under the collar. After previously registering online or by phone, artists are free to add their work to the skate park, and have their designs live on forever… well, until someone new paints over them, of course! An artist who is making a name for himself throughout the city, Axe Colours mainly composes his work in Barcelona’s quirky Gracia district. His style takes that of a visual biographer, painting famous faces like Breaking Bad’s Walter White, Lionel Messi, and characters from the Game of Thrones series. 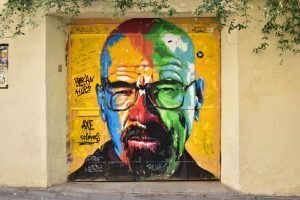 Due to Barcelona’s prohibition of street art on public walls, many artists have resorted to adding their designs to shop shutters, surprisingly good canvases for graffiti paintwork designs… And Axe Colours is no exception. Alas, you may need to wait until closing time to see some of his sensational work. But trust us, it’ll be worth it. Read a guide to Axe Colours’ in Gracia. Recognise this? We’re not surprised- this mural has made an appearance on the Instagram account of anyone that has ever visited the city. The Kiss of Freedom– also called “The world begins with every kiss” – can be found near the Cathedral of Barcelona in the Gothic Quarter and consists of small individual ceramic tiles that can only be seen clearly on closer approach. The photos on these tiles come from 4,000 readers of the Spanish newspaper El Periódico who were asked which memories or moments gave them their own sense of freedom. Together, these memories form two kissing mouths which stretch for a total of 8 x 4 metres in size. This beautiful piece was created in 2014 on the 300th anniversary of the fall of Barcelona during the War of the Spanish Succession. Click here to find our favourite designs on an interactive map.